The map below shows the scramble and partition of Africa. In the 19th Century, European nations began claiming large sections of the inland territory to be their colonies. 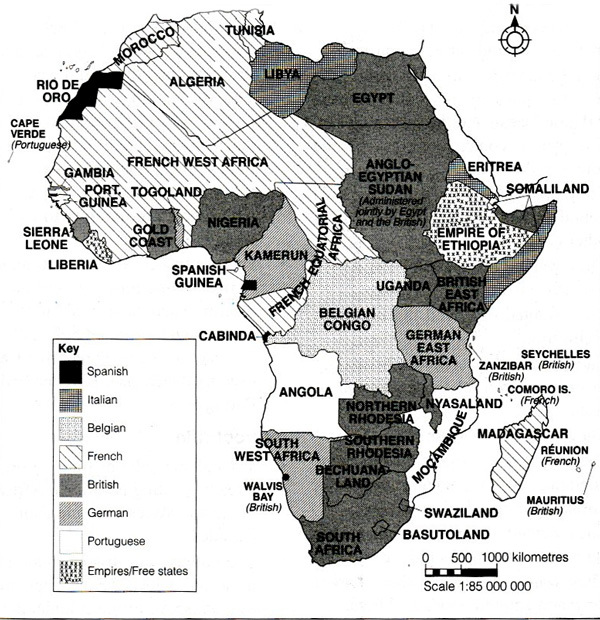 This struggle to control parts of Africa by European nations was known as the Scramble for Africa. The scramble caused strong rivalry amongst the different European nations. To resolve this, it became necessary to share out the continent amicably amongst the various European countries. In 1884, Otto Von Bismarck, a powerful German leader, invited all European powers a conference in Berlin where they divided the African continent amongst themselves. In 1890, the Germans and the British met and drew up the boundaries between the British areas and the German Territory of Tanganyika. This was known as Anglo-German Agreement of 1890. Each country wanted to prove its power and control in Africa. Owning a colony in Africa was a source of pride and prestige. To control sections of the continent meant that they could exploit resources that were needed for European industry. Some countries wanted to control the trading routes in the Sahara, Atlantic Ocean and the Indian Ocean. The Arabs controlled most of the routes at this time. They had made money in their own countries and wanted to invest it in other continents. They wanted to create jobs in Africa for their citizens. They wanted to spread the European civilisation. They wanted to spread Christianity in order to control the expansion of Islam. They felt that to be more developed; they wanted to protect the rest of the world from harmful practises. They wanted to protect their citizens operating on the continent as explorers, missionaries and traders. They wanted to create settlements for some of their people on the continent. They wanted to expand their market for manufactured goods in Africa. Colonial administration used this method to rule people in colonies. This meant that they appointed officers for their countries to rule on behalf of the home country. These officers included PC, DC and DO’s. Colonial administration in Kenya used Direct Rule. The British in the colony had a Legislative Council (LegCo) which was established in 1906 and made all the laws that governed the colony. The British, like the other colonial powers on the continent believed that Africans would take a very long time to mature and be able to govern themselves. During the period of colonisation, Africans were ruled, patronised, discriminated against on racial grounds, and alienated politically and economically. Direct rule was used by the British, Belgium and Portuguese. The colonial administration used the already existing traditional systems to rule colonies. The colony was divided into smaller units and a local leader appointed to rule on behalf of the colonial power. This system was used by the Italians, Spanish and British in Northern Niger and Uganda. In this system, the colonial administration tried to convert Africans from their culture to Western culture. They wanted to make Africans one of their overseas provinces. This system was used by the French. The British rule in Kenya started in 1888 when the IBEA Company obtained a Royal Charter to establish colonial administration in the East African region. The IBEA Company was interested trading, rather than administration. It however, did set up some administrative centres in key places like Mombasa, Machakos, Fort Smith (as Kabete was known then) and Eldama Ravine. The proper British colonial administration did not start until 1895 when the Protectorate was declared over the country by the British Government. The system of government used by the British in Kenya is shown below. In the main coastal towns, there was an Arab governor called a Liwali. In the interior, there were junior administrators called Akidas. Akidas were mainly Arabs or Swahili people. Under the Akidas, there were local chiefs or village headmen called Jumbes. Their main duty and responsibility was mainly to collect taxes. The Jumbes were generally poorly supervised and they therefore had a lot of power in the areas. This made them very unpopular. In the few areas where there was a strong centralised traditional government indirect rule was used. Germans were encouraged to settle in the northern highlands and plant cash crops for export to Germany. This was not successful. The government then decided to encourage local people to grow cotton. Some African Farmers were willing to grow cotton but other farmers refused. The Germans then decided to force the people to grow crops. Those who refused to grow crops were beaten and mistreated. Those whose harvest was poor were also punished since it was felt that they had not put in enough effort. This was highly resented by the local people in Tanganyika. By 1905, the Germans had felt confident that their policies and activities had become very successful. On the contrary the local people had many grievances against their rule. They also objected to being forced by the Germans to grow crops and to the brutal methods used to ensure that their orders were being obeyed. It was mainly such grievances that led to the outbreak of the Maji Maji Rebellion in 1905. The French established what they called “four communes” of Senegal - St. Louis, Dakar, Goree and Rufisque. The French practised the policy of Assimilation. This meant that the African people were to assimilate or absorb the French culture. In return, they were promised equal status socially, economically and politically as the other French citizens. As it turned out later, this equality was only in theory but not in practice. During assimilation, blacks were to meet the following conditions. Learn how to read and write French. Abandon African culture and take up French culture. They were allowed to vote for their representatives in the chambers of deputies. They were allowed to be elected in the chambers of deputies. They enjoyed the same rights like the White French. The policy of assimilation failed and was replaced with the policy of association. It was expensive for the French government to maintain. French feared competition from Africans. Africans were not ready to abandon their culture. Most of Senegalese were Muslims and it was not easy for them to be converted to Christians. Africans who lived in the communes were treated like citizens of France. They were allowed to vote and to elect one Deputy (similar to a Member of Parliament) to the National Assembly in Paris. Later, Europeans begun to argue that they were more evolved than the Africans, and so they were more superior to the Africans. These views encouraged Europeans to exploit the African continent and people. Most of the power in the colonies was based in France and there was very little delegation of power within the colony. No decisions were made unless the right channels were followed, and in many cases, the feelings and views of African subjects were not taken into account. They forced Africans to grow cash crops like groundnuts, coffee, cotton and palm oil which were then exported to France. They regarded them to be overseas France and there was therefore no way, according to them, that the colonies would attain self- government. Most of the power in the colonies was based in France and there was very little delegation of power within the colony. No decisions were made unless the right channels were followed, and in many cases, the feelings and views of African subjects were not taken into account. They forced Africans to grow cash crops like groundnuts, coffee, cotton and palm oil which were then exported to France. The French citizens were only found in the four communes. The laws within the colonies mainly came from France, and it was in form of decrees or orders. These decrees were made by the Minister of Colonies in charge of all French colonies. Issues affecting colonies were never discussed in the National Assembly in Paris. The minister only sought advice from the Governor Generals who were stationed in the colonies and made decisions based on their recommendations. During the partition of Africa, King Leopold II of Belgium acquired Congo and renamed it the Congo Free State.This was not a colony, but a business empire or organisation run by him. King Leopold II invited private companies to start development projects in the empire. He gave generous rewards to any company that agreed to come into Congo to start a project. Large pieces of African land were taken by foreign companies who then exploited minerals and tree products and sold them at a profit to European countries. Leopold then shared the profits. From 1895, onwards, exploitation of wild rubber was the main activity. Africans were forced to collect rubber from the forests and deliver it to European companies. These companies also taxed the Africans in form of rubber, ivory, food or cash.As a result of this, Africans had to work very hard to ensure that they paid their taxes on time. In return for their hard labour, they got nothing and this became a new form of slavery. Other punishments included imprisonment, and in extreme cases, offenders were shot dead. These mistreatments were opposed by other countries in the World. In 1908, the Belgian government took over the administration of the Congo Free State and it became a Belgian colony. The Belgian administration was mainly indirect rule which was done through traditional chiefs.After the First World War in 1918 significant changes were made.Small districts that had been created by the Congo Free State were combined into larger districts called Secteurs, or Sectors. Townships which served as headquarters of the Secteurs had schools, health centres or dispensaries and a local court. Foreign companies realised that if they paid good salaries and improved working conditions of their workers, then they would make them happy, and they would work better. They then started building houses and providing social services like health and education to their employees. Congo finally became independent in 1960. When the Portuguese acquired Mozambique during the Berlin Conference, they treated it as an extension or extra province of Portugal. They introduced the policy of assimilation in Mozambique which is similar to the French policy of assimilation. This policy aimed at making Africans adopt the Portuguese values and way of life. Portugal was the oldest colonial power in Africa and was the last one to leave. The Portuguese colonised Mozambique for about 500 years before it was able to regain its independence. During their rule, Africans were mistreated by settlers who had taken control over them. The Africans in Mozambique protested against the Portuguese. This led to the development of African liberation movements whose aim was to fight for independence. UDENAMO - Union of the Democratic National Movement of Mozambique. MANU - Mozambique African National Union. UNAMI - Union of African Independence in Mozambique. FRELIMO - In 1952, the movements came together and were called FRELIMO, which stood for the Front for the Liberation of Mozambique. Its first leader was Dr. Edwardo Mondlane. This is the party that led the country to independence. a) The Africans lost their political independence. b) Some traditional political institutions were destroyed and replaced with foreign ones. c) Foreign culture was imposed on Africans without regard for their own culture. This led to the loss of the African culture. d) Many followers of traditional religion were converted into Christianity. They were made to believe that their traditional beliefs were primitive. e) Africans lost large tracts of their land to the European settlers. g) Africans were discriminated against and mistreated in their own countries. h) Africans were viewed as slaves rather than free people. Africans provided free forced labour on settler farms. j) People from the same traditional communities were divided and placed in different countries or colonies. k) The Africans were forced to trade with the colonial master much more than with fellow Africans living in neighbouring states. l) Taxes broke down the traditional way of life as young people moved away from home to look for jobs on farms in order to earn money. m) Foreign companies exploited resources on the continent. However, they did not put back any of the profi ts to develop the continent. n) People started adopting new vices like greed, bribery and corruption. o) In most colonies, there was no sense of democracy, justice or equality. African people were treated badly. p) Development within the colonies was not balanced or uniform. It tended to favour areas occupied by white settlers. a) Colonial rule brought an end to slave trade. b) Modern health facilities, formal education and other social services were introduced ninto the country. c) Colonial governments introduced modern methods of communication. d) Cash crop farming was introduced. e) Traditional farming methods were improved through research and adoptingnew methods. f) New breeds of animals and crops that could do well under the African climate were introduced. g) The African people developed the desire to control their own future and worked towards achieving justice and equality. i) It introduced a new legal system. j) It brought manufactured goods some of which could not be produced locally. k) It introduced modern machines which are now used in agriculture and industries.